From frozen best if deep fried at 350ºF for 6-8 minutes, or if baking, brush with egg wash and bake in a 350°F convection oven for 6-8 minutes or until internal temperature reaches 165ºF as measured by use of a thermometer. Empanadas, empanadillas, and pastelitos. For centuries, these popular street foods have been enjoyed by countless patrons throughout Latin America and Spain. 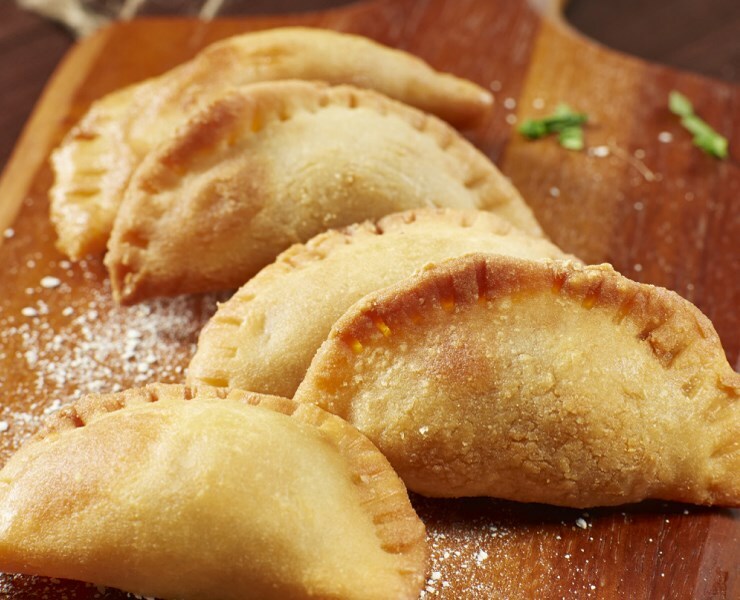 Consisting of a savory or sweet mixture, folded in pastry, deep fried or baked, empanadas continue to gain the attention of consumers for all occassions. With today’s ever-changing dining palettes, today’s consumers are requesting more unique and authentic flavor profiles. To offset these demands, Kabobs’ Shrimp & Avocado Empanadas provide your customers with a Latin American inspired delicacy, with fresh shrimp, paired with the vibrant colors, and smooth buttery flavors, of avocados, mixed with hand cut bell peppers, capers, Monterey Jack cheese, and garlic. Our culinary team hand folds this colorful savory mix into an arepa empanada pastry. Latin American inspired. Robust flavor.